This kit contains a full season's bacterial needs at a discounted price. 1 Quart - Spring/Summer Cleaner - Specially formulated to accelerate the breakdown of leaves, small branches, and other accumulated dead organic waste. Microbe-Lift Spring/Summer Cleaner reduces buildup of dead leaves and residual organic sediment. 1 Quart PL - A natural, beneficial, environmentally safe bacteria that is non-pathogenic, non-toxic and non-caustic. Microbe-lift PL creates a healthy environment in your pond and promotes faster fish growth. It improves dissolved oxygen levels and reduces hydrogen sulfide odors. Microbe-lift PL works in both high and low alkalinity. It metabolizes dead algae and dissolves away organic sludge. 1 Quart TheraP - Provides a natural pond eco-system, resulting in better fish health and improved water clarity for use with all ornamental, cold water, temperate, cyprinids, native and wild species of fish. 1 Quart - Autumn/Winter Prep - Specially Formulated for Pond Winterization. Microbe-Lift A/P helps accelerate the decomposition of leaves, scum sediment, and other organic matter during the fall and winter months. 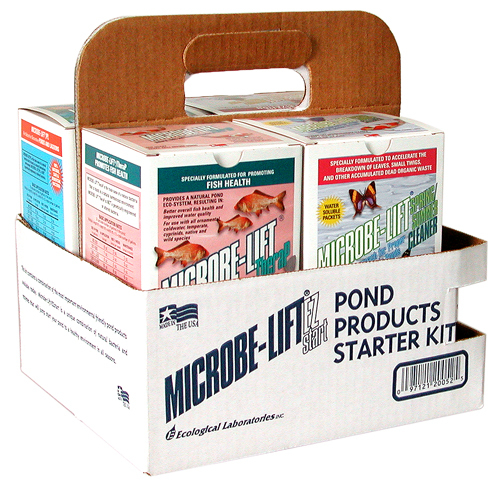 Microbe-Lift/AP will also jump start your pond to a healthier environment in the spring.